There will be three preliminary rounds, followed by a final round. The top three competitors go to State. There are no alternates. 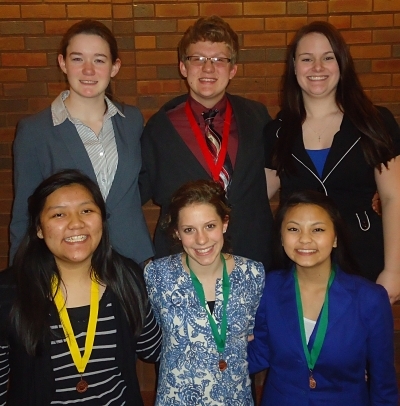 Depart Tracy at 7:00 a.m.
Front row, left to right: Selena Herr, Drama, 4th place; Sarita Hook, Extemporaneous Reading, 5th place; PaNhia Vang, Drama, 5th place; back row: Hannah Brockway, Storytelling; Noah Tiegs, Poetry, 2nd place; Madeline Caron, Discussion.